Alterum: the music begins with a woman’s plea to her sister for help. In the stories handed down on the Hebridean island of Barra from which the song comes, it is said that the woman who composed the song was being held prisoner in a fairy mound. Julie Fowlis sings this song, A Phiuthrag ‘s a Phiuthar, in Scottish Gaelic. She is known for that, both for her gifts in the arranging and singing of songs from past and present, and her intelligence and skill in seeking out and choosing such songs. The album Alterum began for her as a project exploring Gaelic songs of the otherworld, Fowlis writes in her sleeve notes. There are stories of fairies and water horses, legends and myth, unexplained natural events, and places that may be real or not. As she explored and expanded this idea into choosing songs for recording, for the first time on an album of her own, Fowlis decided to include songs in English as well, and a song which includes both Gaelic and Galician lyrics, too. She has sung in English and in other languages on different projects (for the Disney/Pixar film Brave, for instance). When preparing her own albums, though, Fowlis had never felt any particular pull to include songs in English -- until this time. Woven as they are into the theme of otherworld, Go Your Way by Annie Briggs and Windward Away by Archie Fisher offer, in different yet related ways, explorations of love, mystery, and time. That could be said of each of the songs on the album, and indeed the sequence of all the songs played out as Fowlis has set them. There’s that call for help from a fairy hill to begin things. Gilllebride MacMillan joins in on Camariñas, a traditional Galician song which brings a ray of sunlight to the proceedings, as does the lively combination of two pieces of mouth music, Fear a’ bhrochain and Dòmhnall Bin. There is an indeed otherworldly story and sound to Dh’èirich mi moch, b’fheàrr nach d’ dh’èirich (I arose early, would that I hadn’t). It is a story of legend entwined a story of grief and change. There is that song of lost love, Go Your Way, a seal song, another rather mysterious love song in Gaelic called Dh’èirich mi moch madainn cheòthar ( I arose early on a misty morning). There are several other songs in Gaelic, and there is Windward Away, which holds enough mystery for several stories all on its own. Fowlis sings each of these songs with intelligence and grace. You needn’t know Scottish Gaelic to appreciate the power of emotion and story she brings to this well thought out and well sequenced collection. She is well supported too: Eamon Doorley on bouzouki and other instruments, Donald Shaw on piano and harmonium, Tony Byrne on guitar, Ewan Vernal on double bass, Duncan Chisholm on fiddle, and Su-a Lee on cello are among those who add their instrumental gifts. 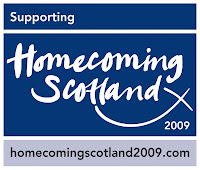 In addition to Gillebride MacMillan (if you are thinking his name sounds familiar, you might be recalling that he appeared as the bard in Outlander ), award winning singers Mary Chapin Carpenter from the US and Muireann Nic Amhlaoibh from Ireland add harmonies on several tracks. Alterum: that title is a word which may mean difference, change, other. Scottish Gaelic is a language not many speak; legend and mystery of the Celtic world (any world, for that matter) are paths not many tread through music or in other arts. 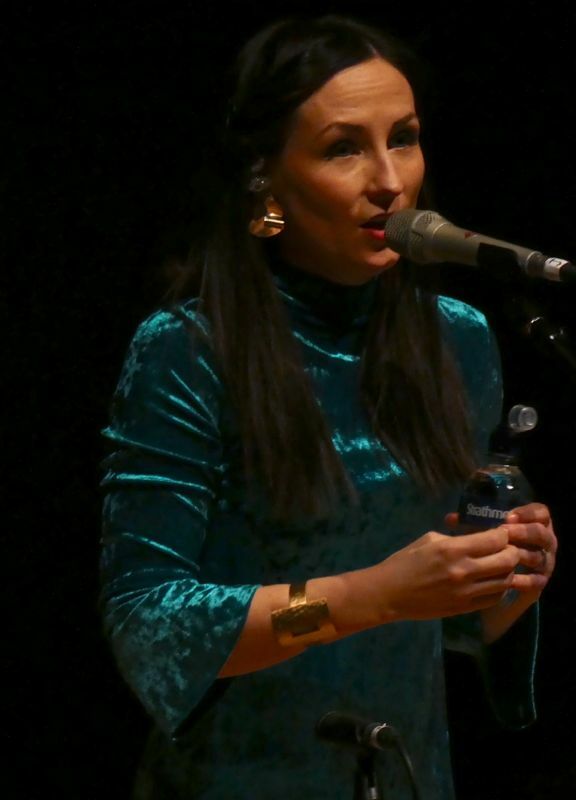 Along the way through the music she has chosen for Alterum, Julie Fowlis leads her listeners on a meditative, spirit infused, and spiritual journey which draws on story, language, voice, and music. 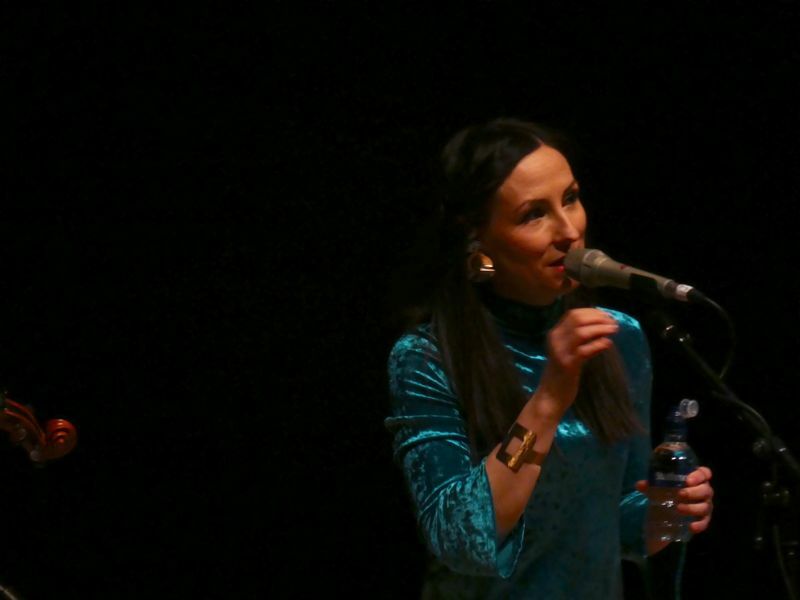 Photographs of Julie Fowlis in concert at City Halls during Celtic Connections 2018, made with permission of the artist, the venue, and the festival. Thank you for respecting copyright.